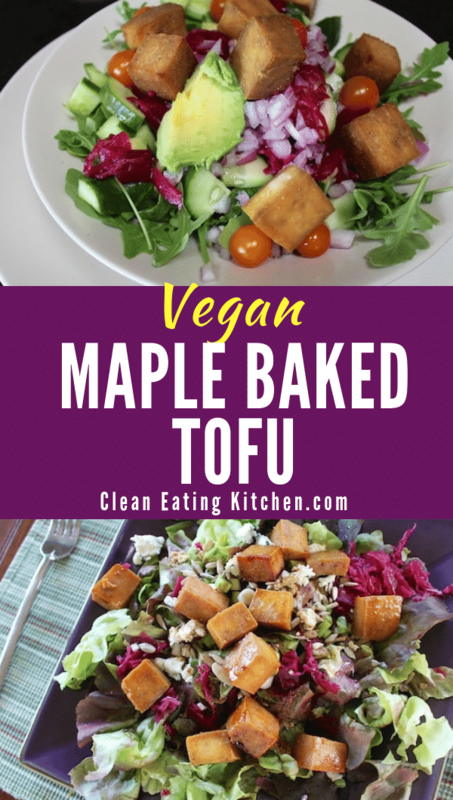 Maple Baked Tofu is so easy and a great protein-rich option for vegetarians and vegans. Serve it as a main dish, or on top of a salad. I first posted this picture of my Maple Baked Tofu on my Instagram account and got a huge response from followers saying how good it looked; I’m super excited to share the recipe with you. 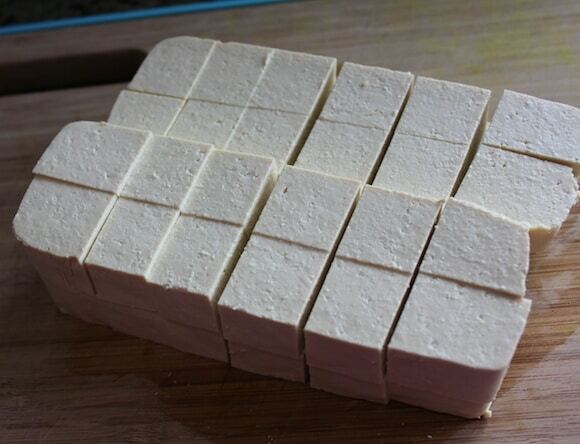 It’s funny how easy it is to bake tofu and yet I’ve never posted a recipe for it before. To be honest, when it comes to soy products, my preference is tempeh, but Alan luuurves this recipe so I make it about once every two weeks. And, since we just moved(!) last week and are still just trying to get settled, this recipe fits the bill because it requires so few ingredients and is really versatile. 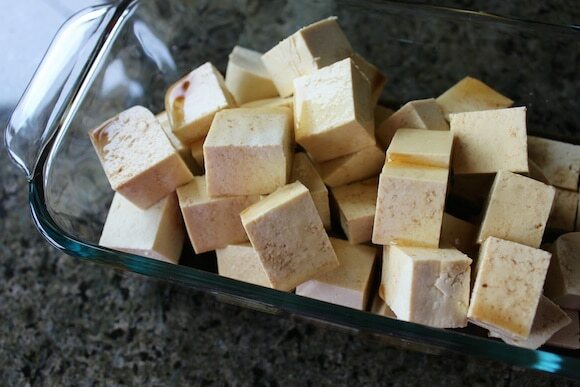 Maple Baked Tofu is a super easy and delicious protein option. Remove tofu from the packaging, draining the liquid. Use a clean towel to dry gently. 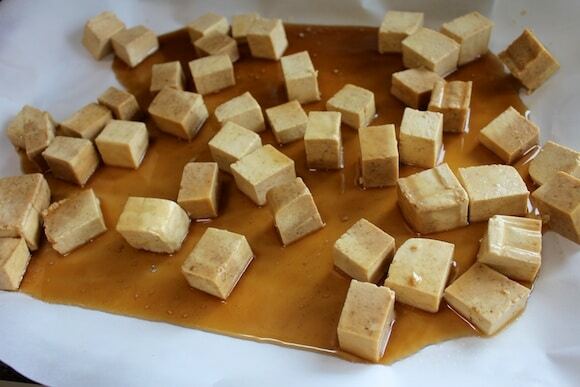 Cut tofu into cubes and place in a glass dish. Add maple syrup and tamari and toss with the tofu. Let marinate for at least 30 minutes, or up to 24 hours. Line a baking sheet with parchment paper. 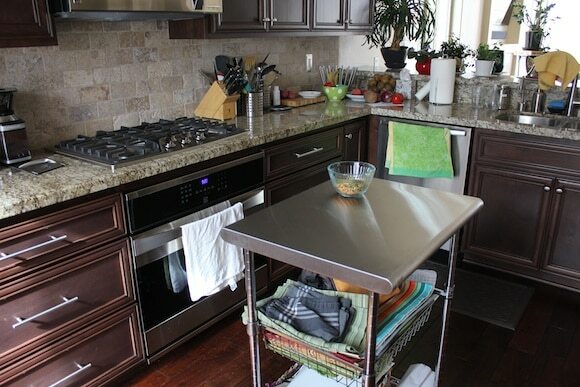 For even easier clean-up, you can place a sheet of aluminum foil underneath the parchment paper as well. Spray the parchment paper lightly with non-stick cooking spray and pour the tofu and the marinade onto the baking sheet. Bake for 45-55 minutes, flipping once, until the tofu is golden brown. Serve hot or at room temperature. I’m kind of proud of myself that even with all of the chaos that comes with moving, I’ve been able to pull together enough easy meals at home to maintain my focus on eating healthy foods. Don’t get me wrong, I’m not opposed to eating at restaurants anymore and I always love a Whole Foods salad bar trip (it’s totally worth the $$ for someone else to chop all of those lovely veggies), but because I’m pretty picky about using high quality ingredients and watching the food budget, my first choice is always to eat at home. 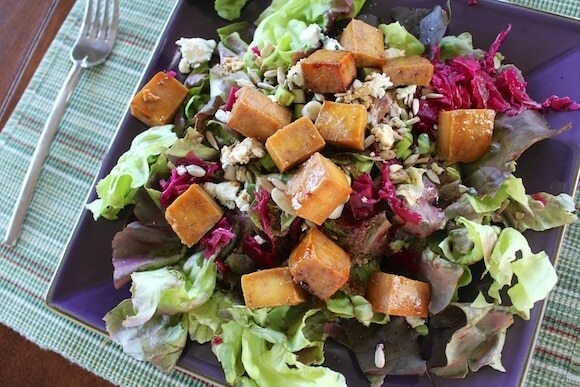 Pin this Vegan Maple Baked Tofu recipe to save it for later! That’s for sharing that simple yet delicious recipe! 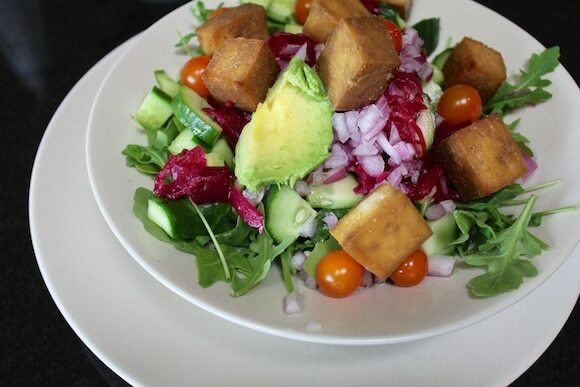 I had baked tofu in a salad at a local cafe a few years ago. I tried making it and wasn’t thrilled with the outcome. So I was really excited to try again with your recipe. A+! I can’t believe how easy it is to achieve such a flavorful punch in salad! Thanks for sharing! Also, I checked out Simply Nourishing Foods and Candace’s webpage, Yoga By Candace — I really like them both! Thanks, Diane! I loved sharing the picture of my kitchen. I took one of the inside of my pantry and fridge and realized they’re still way too messy for public viewing. 🙂 Enjoy the tofu! 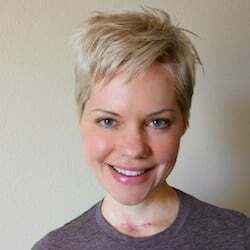 Awesome, Jenni, I would LOVE for you to be a contributor to the board. I found you on Pinterest and I think I was able to send you an invite…let me know if you don’t get it. Yay!!! Yummy! 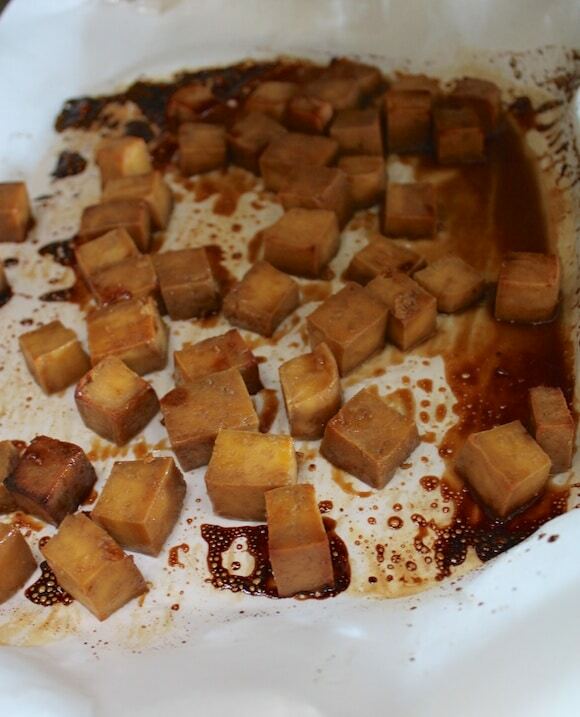 Baked tofu is my favourite, love the simplicity of this recipe and the fact it looks delicious! We don’t have tofu very often, maybe once a fortnight but really enjoy it when we do. Does it come out crispy Carrie? Love your kitchen!! 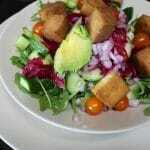 The baked tofu dish looks so easy to prepare, I will make it soon. Have you tried breeding your tofu and baking it? 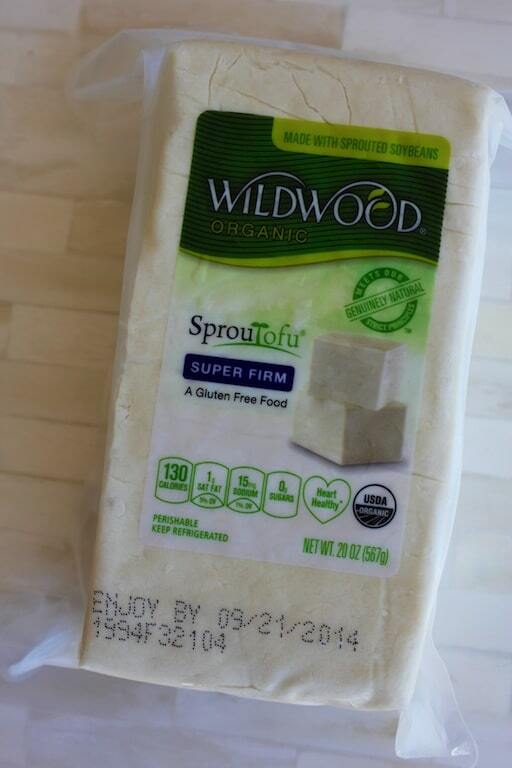 We love using the same tofu in your picture but coating it in egg whites and rolling it in panko bread crumbs. We bake them in the oven and they are so crispy. You can hear the crunch as you bite into them. I highly recommend this way of cooking tofu. It’s our new fave! OMG, have not tried that, but sounds yum yum yum! 🙂 Do you have any idea if there are gluten-free panko options? Just did a quick google and there are several brands that are gluten free. Ian’s and Glutino were the first that came up. I was just thinking these would be awesome on your salad for texture. Reminds me of the fried, breaded chicken people love on their salads but way healthier! Love your kitchen – it looks great! I’m all about simple cooking these days – Terry would also love this recipe. I love how quick & easy it sounds to make. I would love to be a contributor to the new pinterest board! It sounds wonderful. Hey soul sista, I just sent you an invite for the board. Xoxo. Carrie thanks for the recipe. I was thinking about it all morning and thought I’d check to see if you’d posted it yet and – voila! – here it is. I can’t wait to try it on my own. Awesome, Kenny! See how easy it is, I almost felt embarrassed to call it a real recipe. Let me know if/when you make it and how it turns out for you. You’ve got a lovely kitchen! I’m excited to try this tofu recipe.